College Football Playoff Semifinal Saturday to Feature 18 Hours of College Football Content Headlined by the Capital One Orange Bowl and Goodyear Cotton Bowl Classic on ESPN - ESPN Press Room U.S.
A college football Saturday, indeed. ESPN’s coverage of the College Football Playoff Semifinals will include more than 18 hours of college football content throughout the day, including the MegaCast presentation for the Goodyear Cotton Bowl Classic between No. 2 Clemson and No. 3 Notre Dame at 4 p.m. ET and the Capital One Orange Bowl featuring No. 1 Alabama vs. No. 4 Oklahoma at 8 p.m.
SportsCenter kicks off the day at 7 a.m., with Matt Barrie and Elle Duncan, featuring live reports and segments from Arlington, Texas, and Miami. College GameDay Built by The Home Depot will be live from Hotel Victor in South Beach, beginning at 9 a.m., with segments also originating from AT&T Stadium. 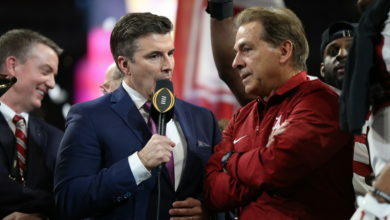 Host Rece Davis is joined by Lee Corso, Kirk Herbstreit, Desmond Howard, David Pollack and Maria Taylor, as well as contributions from Chris ‘The Bear’ Fallica, Jen Lada, Tom Rinaldi and Gene Wojciechowski. Kyler Murray Conversation– The Heisman Trophy winner reflects on the season, his expectations and even dishes about his fantasy football quarterbacks in a one-on-one interview with Gene Wojciechowski. Saban Sit-Down – Tom Rinaldi sits down with the Alabama head coach to talk about the influence of Kobe Bryant, the burden of success and the value of losing. Following the Chick-fil-A Peach Bowl between No. 10 Florida and No. 7 Michigan (noon), Joey Galloway, Jesse Palmer and Adnan Virk will be live from AT&T Stadium for the TurboTax Live College Football Pregame and the Goodyear Cotton Bowl Classic Pregame showcase, airing at approximately 3:30 p.m. Rece Davis, Chris Fowler, Kirk Herbstreit, Desmond Howard, David Pollack, Laura Rutledge and Maria Taylor will be live from Hard Rock Stadium for the TurboTax Live College Football Pregame and the Capital One Orange Bowl Pregame Showcase, airing at approximately 7:30 p.m.
At the conclusion of the Orange Bowl, SportsCenter with Scott Van Pelt, based in Bristol, will provide comprehensive recaps of both games. The show will feature onsite coverage in Miami anchored by Davis with reaction from Herbstreit, Chris Fowler and a host of others. In addition to extensive coverage on ESPN, SEC Network will feature more than 12 hours of content originating from Miami and Charlotte. Full details available here.